Simply Rod Stewart by James Frew is a brilliant tribute to one of Rock music’s greatest performers, Rod Stewart. 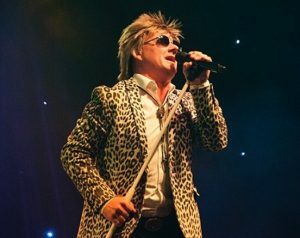 James Frew performs his Simply Rod Stewart tribute act, which perfectly recreates with amazing accuracy Rod’s biggest hits. Simply Rod Stewart combines the iconic hits with great costumes in a show that entertains audiences of all ages! The show is available for parties, weddings, cabaret shows, anniversaries, corporate and tribute nights. James comes Fully self contained with a first class sound system and lighting. James Frew is in a class of his own when it comes to providing a TOP CLASS tribute evening as Rod Stewart. His vocal tone is as close as you will get to the real thing, without “trying” He just sound like ROD. His showmanship and audience interaction and participation give an authentic experience for his audience. Your local pub, club, private function or corporate event, Anywhere in the UK and Ireland. No venue is too small or too big for James to perform his act. With shows tailored to suit ALL venues YOU WILL NOT BE DISSAPOINTED! !